When the antioxidant, vitamin, and mineral rich spinach puree meets the regular roti, then it makes for a colourful roti. Research has found spinach to be beneficial in serious health conditions such as diabetes, heart diseases, high blood pressure among others. 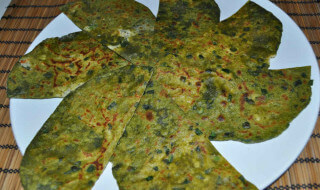 This colourful palak wheat roti could perfectly replace the regular wheat ones. Clean spinach & coriander leaves using water & remove dirt if any. Chop spinach, coriander leaves, ginger, garlic, and green chilli. Grind spinach, green chilli, garlic, ginger, and coriander leaves in a grinder or food processor to make a smooth puree. Do not add water while making the puree. Combine the wheat flour, 1 tsp oil, salt, and prepared spinach puree in a deep bowl. Add water as required and knead a smooth & soft dough. Grease dough and the surface with little oil. Cover it with a clean muslin cloth. Let it rest for 10 – 15 mins. After that divide it into 9-10 equal parts & give them round shape. Take one round ball & convert into thick pattie by pressing between your palms. Lightly coat its entire surface with dry wheat flour. With the help of rolling board & rolling pin, roll it out into a roti of approximately 6-inch in diameter. It should be little thicker than a phulka roti. Place it on a heated tawa/ griddle and cook it as you would cook plain paratha i.e cook each side with few drops of oil until light golden brown spots appear on both sides.